The Mafia did not originate red dye murders. The trusty confidence swindle actually went back many decades. But several crime groups, including the Genovese family and the Gallo brothers, often used the gimmick in their extortion plots. It works as follows. A victim is picked out, often a bookmaker or some other money man, and pressure is put on him and another supposed victim at the same time. There is a general sitdown meeting involving the mobsters, the victim and the phony victim. The mobsters become upset when both their victims are reluctant to pay the protection money demanded. 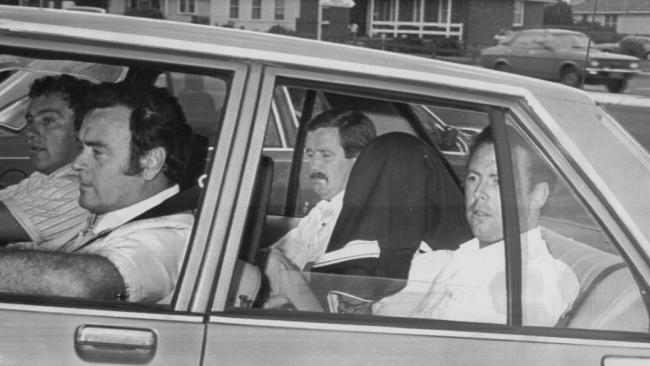 Suddenly things turn violent, and the mobsters pull guns and force the two victims into a car. There the phony victim keeps arguing with the mobsters and suddenly some shots are fired. They are really blanks. The phony victim, however, has been fitted with small explosive caps that discharge blood—really, red dye. The phony victim is pronounced dead before the startled eyes of the real victim. The red dye hoax seems to be rather sparingly used. Perhaps this is because it requires the utmost faith by the phony victim in his confederates. In the twisty world of Mafia contract plots, all that is necessary to rub out a mobster is to sell him on acting the ruse in a red dye murder. In such a case, the murder is real.